Education offers children a way out of poverty and the chance to build a brighter future. Unfortunately, about 264 million children and adolescents around the world do not have the opportunity to go to school. Poverty, conflict, natural disasters and cultural barriers are just a few of the factors keeping girls and boys outside the classroom. 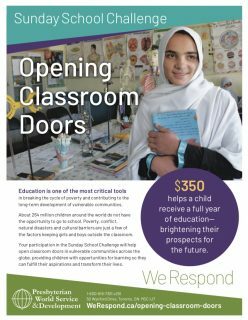 PWS&D is responding by opening classroom doors in vulnerable communities across the globe, providing children with opportunities for learning so they can fulfill their aspirations and transform their lives. We do this by engaging communities about the importance of education, training teachers, delivering school supplies and recreation facilities, and providing support with school fees. By taking the Sunday School Challenge, your gifts will help a child receive a full year of education—brightening their prospects for the future. Donate to the Sunday School Challenge! Download the Sunday School Challenge flyer or order a printed copy by contacting Anna Muir (amuir [at] presbyterian [dot] ca or 1-800-619-7301 ext. 293). Coming in 2019: To accompany the Sunday School Challenge, PWS&D will have a new educational resource!